The place of origin of the Ancient Bulgarians is most likely Eastern Iran, a group of anthropologists and scientists have claimed after an exploratory trip to the Persian lands. The team of six scientists led by anthropology professor Alexander Iliev presented Wednesday their findings after touring Iran for 20 days, traveling 1100 km inside the country. “We have found impressive evidence about the Iranian origin of the ancient Bulgarians,” Iliev stated. The findings include several prototypes of the bronze eagle of the legendary founder of Danube Bulgaria, Khan Asparuh, found in his grave in today’s Ukraine. The Bulgarian team has also researched several graves in Iran bearing similarities to the funerals of the ancient Bulgarians – as well as to those of the ancient Thracians. The ancient stoneworks and bricks that the expedition studied in Iran are also said to be very similar to the ones employed by the Bulgarians in the late Antiquity and early Middle Ages. “Even though the Iranians are darker-skinned, they look very much like the Bulgarians anthropologically. Some of the words in today’s Persian language sound the same as words in Bulgarian. Their traditional musical instruments such as whistles, bagpipes, and tambourine fully correspond our folklore tradition. Over half of the carpers in the Caspian areas of Iran coincide with the ornaments, symbols, and colors of the Bulgarian carpets,” Iliev said. “We should finally forget the thesis that the Bulgarians are Huns of Turkic origin, and should understand that we are from the Indo-European family. We are less than 20% Slavic. The Slavs are not the major element of the Bulgarian ethnicity,” stated in turn historian Georgi Bakalov. The interdisciplinary expedition to Iran was sponsored by the Foreign Ministry, the Bulgarian Academy of Sciences, the Sofia University, and the Tangra TanNakRa foundation. The Ancient Bulgarians are known to have settled into today’s Ukraine in the 6th-7th century AD, and to have advanced to the lower Danube around 680 AD, as well as to other parts of Europe. Long-established theories about the making up of the Bulgarian ethnicity state that the Bulgarian nation was formed through the mixing of the Bulgarians with the local population made up of Slavs and some Thracians. 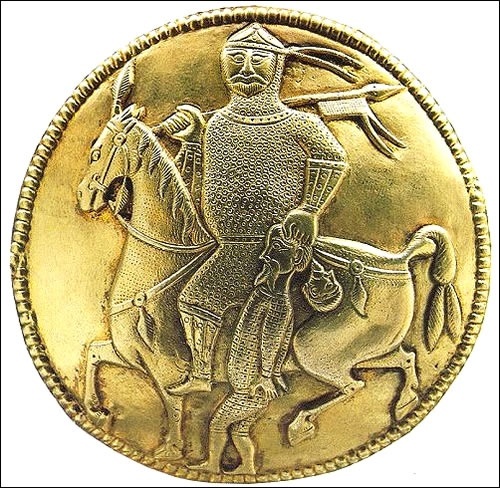 Before 1989 the Bulgarians were believed to have been a minor tribe of tribe of Turkic origin; new research have led scholars to believe that they were in fact more numerous and originated in Central Asia, somewhere in Iran and Afghanistan.